Discussion in 'Model S: Battery & Charging' started by Jagxf, Mar 30, 2016. So i'm thinking of installing my own personal one in my business' outdoor parking lot. My concerns are that it would have to weather Montreal's winters, and various temperatures. It would also have to be secure in other to prevent theft (other people stealing electricity, or stealing the charging cable, etc.). Does anybody have experience/recommendations on what kind of station to install? 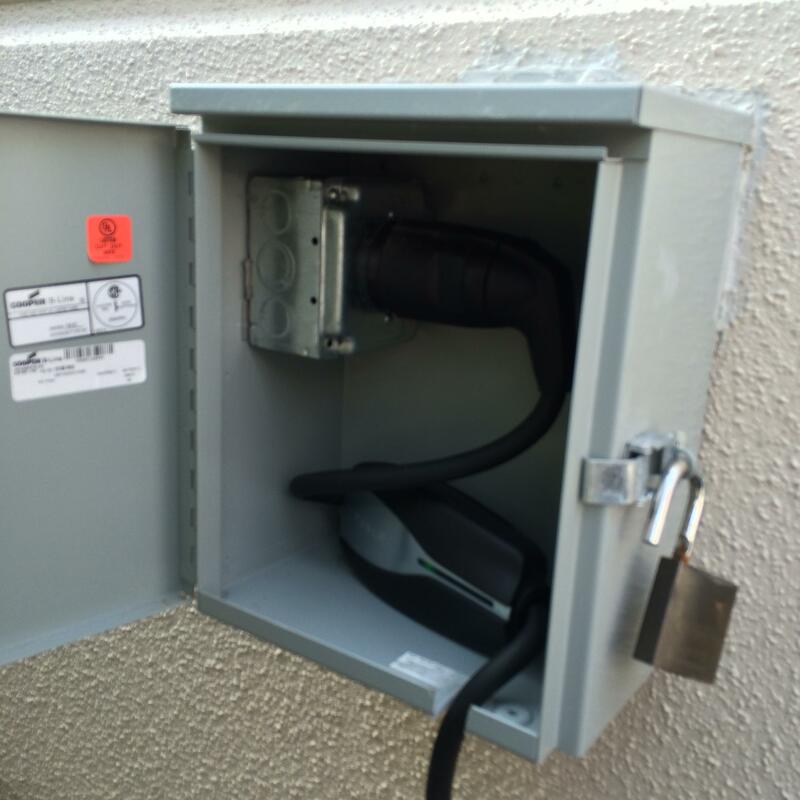 The cheapest is to install a NEMA 14-50 outlet in a lockable enclosure and use the UMC cable that comes with the car. Both are fine in weather. The link in the second post is great. But, it leaves out the Tesla HPWC. That's fine in weather, doesnt require dragging out your UMC. For security, either an inside power switch or a locking enclosure. The advantage is that it can supply 72A (down from 80A since you're in Canada) on the proper electric circuit and will charge nearly twice as fast as using the UMC cable assuming you also buy the dual charger option for your S.
Since you have no home charging, l'd go for the 72A charger at the office with dual chargers in the car since there may be times you really want the faster charge rate. You can buy 70A non-Tesla chargers (see link in 2nd post) and use the J1772 adapter included with the car if you don't want to install a Tesla specific charging point at work. But, the Tesla HPWC will likely be smaller, cheaper, and sexier. Great info, thank you very much! I believe the NEMA 14-50 would indeed be the ideal solution for my case. One further concern I have is, how is the standard plug that comes with the model S? Will people be able to just yank it out easily and steal it? (an unlikely scenario, but you never know). I hear it is an expensive cable, so if that is the case, it seems like an easy target for thieves. Will people be able to just yank it out easily and steal it? Not without destroying it. While the end that goes into the 14-50 receptacle can be easily removed, the end that goes into your tesla gets locked into the car and can not be removed unless the car is unlocked. But, the photo above is great as it does keep the UMC out of the rain. It's water resistant, but still, It can't hurt to keep it out of the elements. Try asking your company if they'll add it. Mine had 0, then 1, and now 4 chargers to help the growing population of electric cars here, all during the past year. For me - it's another perk of working at my company, and it's one of the things I brag about when talking about where I work! Exactly! Keep asking, ask other EV drives to inquire as well. Our building installed 4, then 4 more for a total of 8 EVSEs (6.6kwh devices). Still more expensive to use them than charging at home, but a great option for those with no home charging abilities. I'm the company owner and i'm solo, so that outlet would be paid by me, used only by myself. Glad to know the cable locks itself to the car while charging. I guess the only dangers are vandalism via forceful yanking (which I imagine is unlikely), or having the 14-50 adapter stolen. They can potentially cut UMC itself out with some of the cable... I've seen a few for sale on ebay, so wonder how those sellers came about just the UMC without car plug. There is a Quebec based manufacturer of EVSE units called AddEnergie. They do have the capability of RFID and other means to allow only those who should get power, to get power. AddEnergie is supplying all of the EVSE to Hydro-Quebec. They can make aN EVSE to your specification.